On this trip, we have chosen the highlights from our different winter trips in Greenland and put them together to an ultimate 8 days trip! 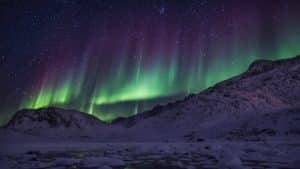 This trip starts at the polar circle in Kangerlussuaq – the old American military base, where you have the opportunity to experience northern light, musk oxen, arctic foxes and the Ice cap. After two days in Kangerlussuaq you fly north to Ilulissat and the famous Ice Fiord Kangia. Here you will go on a boat tour to the Ice Fiord and see the huge icebergs up close, hike to the UNESCO site, stay the night in an iglo, go by snow mobile and dog sledge and hopefully see even more northern light. 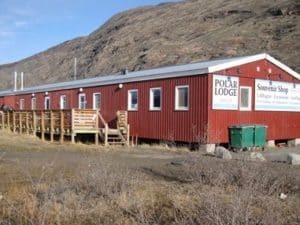 Pick up at the airport and transfer to Old Camp Hostel, where you will stay while in Kangerlussuaq. Old Camp is a cosy hostel with dbl. rooms and shared toilet and shower facilities. Upon arrival at Old Camp, we will hold a short briefing about the activities in Kangerlussuaq. The first day in Greenland you will go on a trip to the ice cap, which is situated around 40 km away from the old American military base. You will be driving in 4×4 van and the trip runs through a beautiful mountain landscape formed by the ice. If you are lucky, you will see musk oxes and arctic foxes. Kangerlussuq has the highest concentration of musk oxes: around 20.000 animals. If the conditions are good, we will have the chance of getting all the way up and walk on the ice cap. Some places the ice cap is more than 3 km thick. We will have a beautiful view over the ice cap. 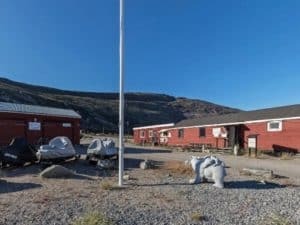 Back in Kangerlussuaq you will have enough time to have a closer look at the old American base, which was handed over to the home rule of Greenland in 1992. A visit on the local museum will give you an interesting insight in Kangerlussuq and the Greenlandic history. Or you can buy an additional trip, if you want to try to sleep on the Ice Cap. In the evening we recommend eating dinner at restaurant Roklubben (Rowing Club) which is beautiful situated at the shore of Lake Ferguson. They serve a really good dinner, and it’s a very good place to experience northern light on a clear night. Extra – sleep on the Ice Cap?? You can also choose to try to sleep on the Ice Cap. On this two-day ‘mini-expedition’ you will walk in the footsteps of the legendary polar explorers, and you’ll experience the magnitude and greatness of the ice cap. You’ll sleep in expedition tents on the ice cap. All safety equipment and sleeping gear is included. Add-on: € 200. Breakfast at Old Camp. Around noon you will fly north for about 45 minutes before landing in Ilulissat (‘Ilulissat’ means ‘icebergs’ in Greenlandic – and for a reason!). When you approach Ilulissat by air you will see the gigantic icebergs as long as you can see. Your transfer will be waiting for you in Ilulissat and drive you to your hotel “Hvide Falk”, which has a fantastic view over the Disko Bay. The first thing on your program is to meet our local guide and get a 2 hour city walk. If you have any questions regarding your program in Ilulissat you can just ask the guide. 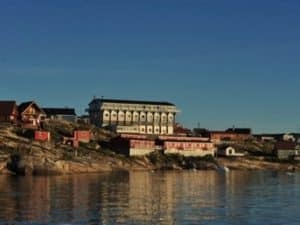 The first day in Ilulissat you will do a walk around town and get to know the interesting history and the town where you will spend the next days. 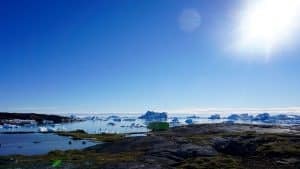 You will see the fishing harbor, the old colonial part of Ilulissat and town museum, which was also home of the famous polar explorer Knud Rasmussen. If you want to rent warm clothing for you dog sledge trip tomorrow, you should do it today. After breakfast you will be picked up and driven to the dog area. This is where todays adventure begins, when a local hunter is taking you on a dog sledge trip in the back country of Ilulissat. The trip takes around 3 hours, and will take your through different beautiful winter landscapes. It’s important, that you are in good physical shape to go on this trip. Please don’t hesitate to call us for more information about this trip. If you want, you can also prolong the trip for a 5 hours trip instead of 3 hours trip. Breakfast at the Hotel Hvide falk. Before lunch you will do a hike with our guide to the Sermermiut Valley which has been protected by UNESCO since 2004. This hike might be the most beautiful hike, you will ever do! It is not hard, it is not long, but the views over Kangia Icefjord is a sight to behold! Here you can also experience remains of old Inuit cultures, but the biggest attraction is the amazing view to the Icefjord, were 10% of of all ice coming from the Ice Cap, goes through this narrow straight. The view is breathtaking! 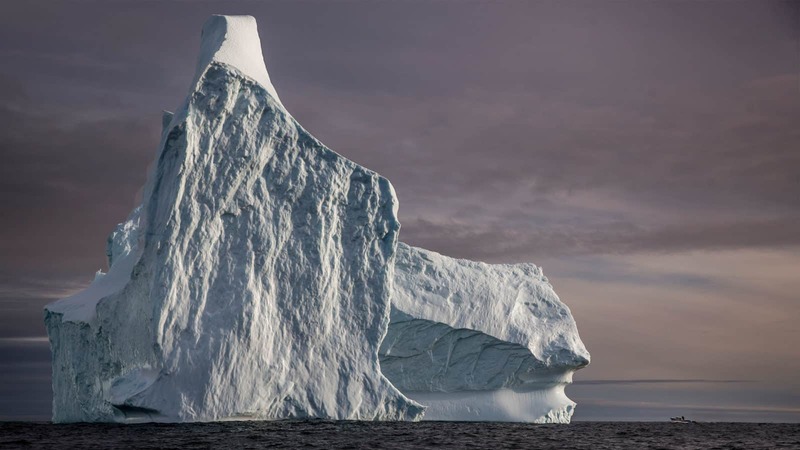 In the afternoon you will go on a boat tour to the Ice Fiord, where you see the ice bergs from a very close but safe distance. During the summer time the glacier Kangia can move up to 50 meters a day! The trip starts after breakfast, when you go on a snow mobile out through the winter landscape til the Iglo Lodge. The trip takes around 1,5 hour and after arriving, you will be greeted with hot coffee and refreshments. There are in total 5 iglos with space enough for 2 persons in each iglo . In the coldest winters, the temperatures can get down to -4o degrees celcius, but inside the iglo the temperature is normally around 0 degrees celcius. You will get warm sleeping bags and information on how to keep warm. If you during the night thinks it’s too cold for you, you can always go inside the nearby hut. The afternoon program includes a snow shoe hike and another trip on the snow mobile to a beautiful view point over the Ice Fiord of Ilulissat. When back in the hut, you will have dinner, before you hopefully will see the northern light. 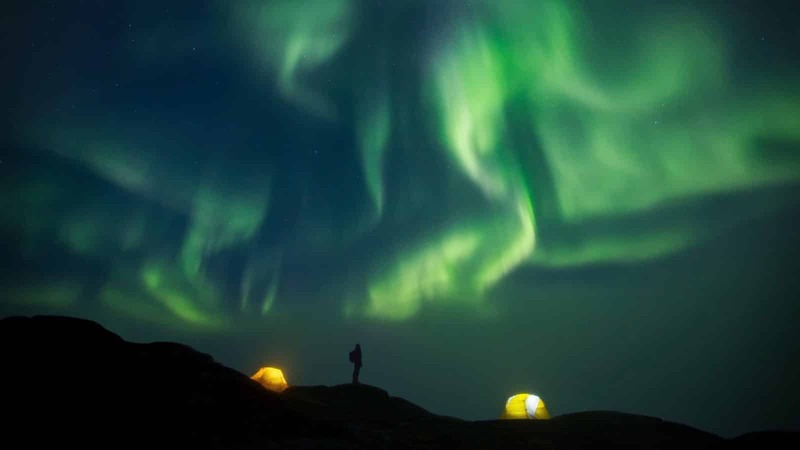 If you get to see the northern light, you are in the right spot – it’s pitch black out here with no light to be seen from Ilulissat – an experience you will never forget. Including in this trip is warm clothing, which you will get the day before departing. We will wake up in our own iglos and slowly everybody will get up and get breakfast before getting ready to return to Ilulissat by snow mobile. Back in Ilulissat you will check in at Hotel Hvide Falk again for the last 2 nights. You have no program this afternoon. You have time to relax or just enjoy Ilulissat on your own. Breakfast at the hotel. You have the day off to explore Ilulissat by yourself. We recommend one of the marked hiking routes in the National Parks which offers nice views of the area, or you can visit one of the local museums or workshops for local artists. Breakfast at the hotel. Early morning you fly out of Ilulissat to Kangerlussuaq. The flight will around 45 minutes, before you will catch your flight at 11.40 back to Copenhagen. Arrival in Copenhagen 20.00. 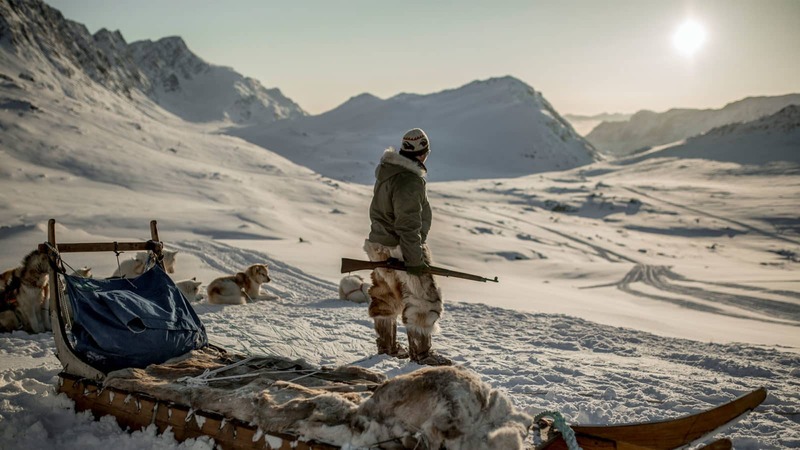 This is our favourite tour in Kangerlussuaq; We offer this new and exciting hike in Kangerlussuaq with our local guide, this will take us out into the wild, where we will look for muskox and cook lunch over open fire; also local food such as snow hare or muskox. This summer we spotted muskoxes on 95% of all trips! We can arrange everything from 2 hours to several days of dog sledge expeditions. The price starts at 130Euro, depending on hour long a trip you like. 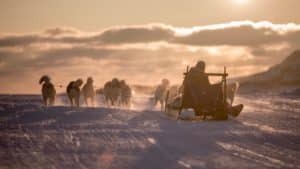 Dog sledging is a very special from of travelling, where you get close to the hunters, in their element. 3 hours dog sledge trip together with a local hunter. 1 person per dog sledge. 1 night in Iglo Lodge – all meals including, snow mobile transfer, snow shoe hike, snow mobile trip to view point, northern light trip. Optional: Arctic walk in Copenhagen before the trip. Apox 2 hours with our local guide, who takes you on a historical walk in Copenhagen with focus on Greenland. Price DKK 350,- per person (€ 48). 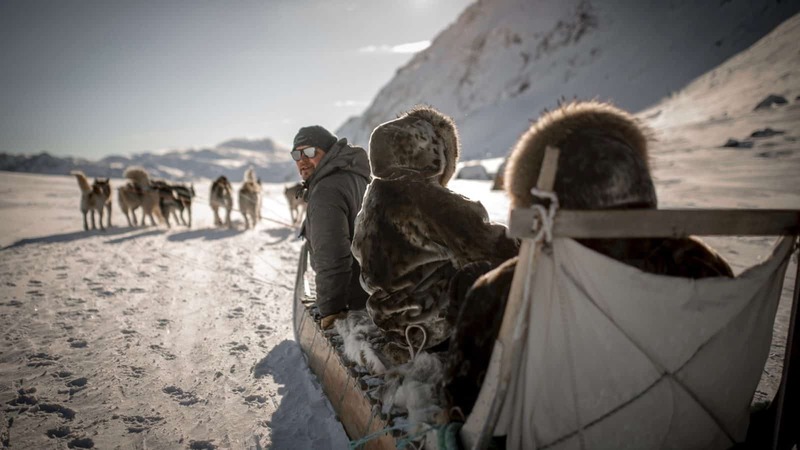 Optional: Change Tundra tour in Kangerlussuaq for a full day mountain walk with our local guide. You will cook your lunch over open fire. Price DKK 750,- (€ 100).